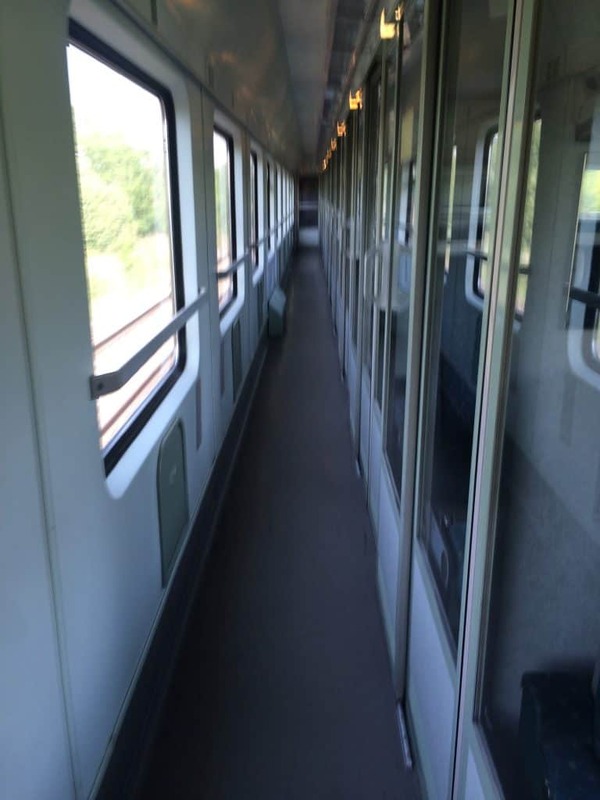 As part of my Europe rail trip last year, I took the train from Vienna to Budapest. There wasn’t a whole lot of information about this (and the Hungarian railway site is tricky!) so here’s the guide I wish I’d had. 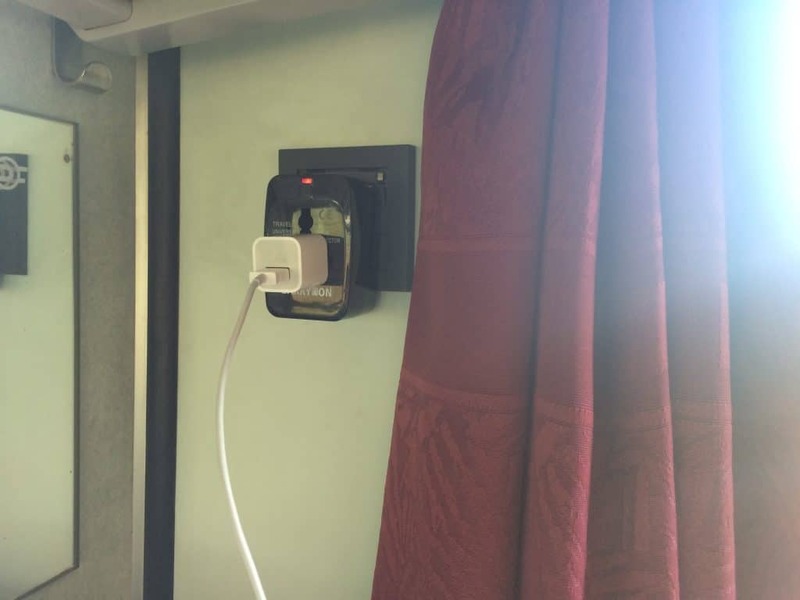 So here’s what you need to know about booking foreign train tickets online: You can book it via the origin country’s railway OR the destination country’s railway. 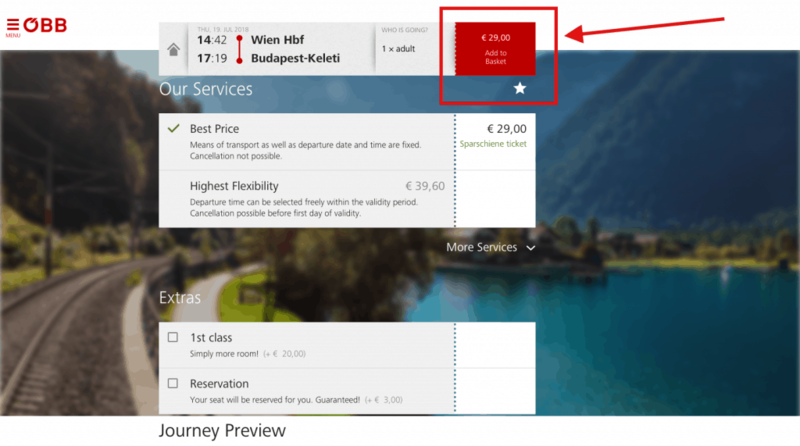 So, in this case, if you’re taking the train from Vienna, Austria, to Budapest, Hungary, you can book the ticket either on OBB (the Austrian railway) OR via MÁV (the Hungarian railway). 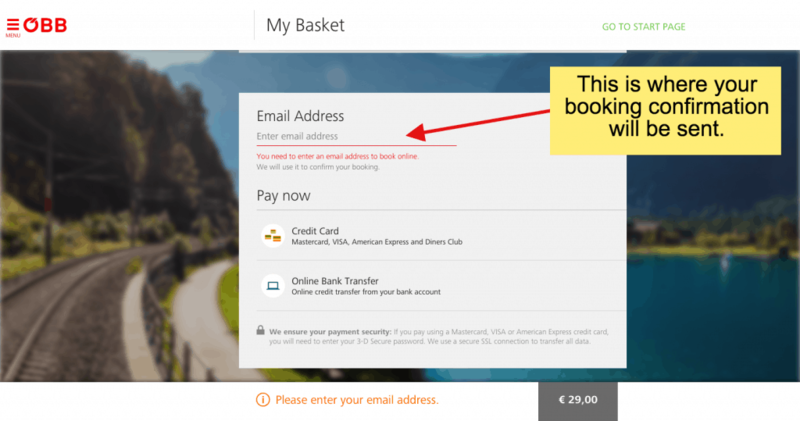 Because the OBB website is MUCH more user-friendly, I chose to book via OBB. Read on to see how to do that! Step 1: Open up the OBB website. 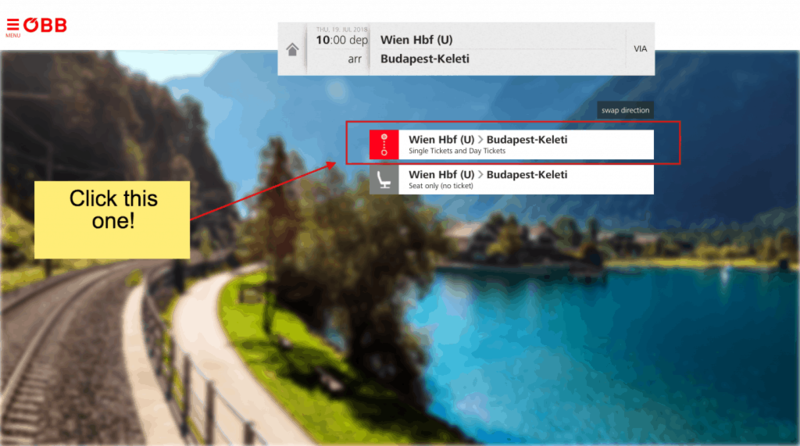 Step 2: Enter “Wien Hbf” as departure and “Budapest-Keleti” as arrival. Step 4: Choose a DIRECT route. There are two types of direct route trains: Railjet (RJ) or Regional (denoted as “D”). I took the Regional train (EC 145) because it’s cheaper, but Railjet is nicer! It’s the high-speed train, though both take the same amount of time, so I don’t know what’s up with that. 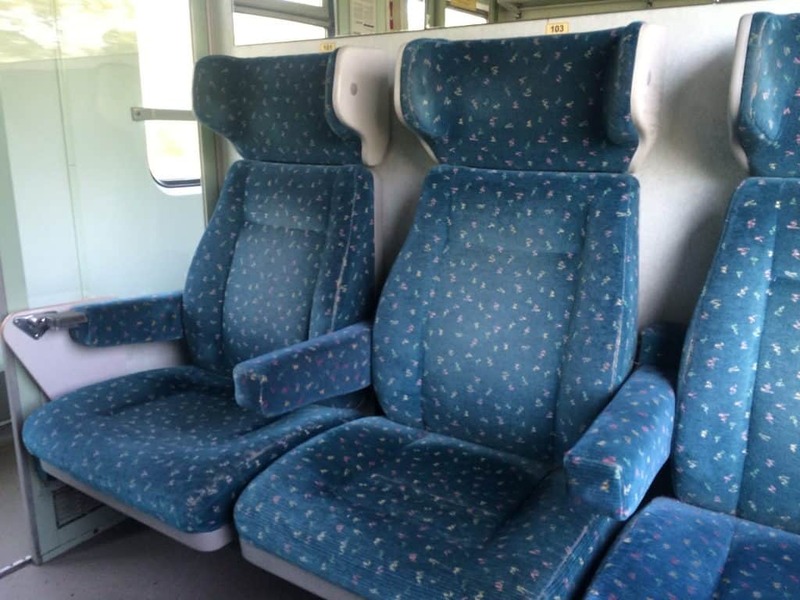 Step 5: OPTIONAL: Select 1st class or Reserved seating. I did NOT select either. I just had to find a seat when I boarded, which wasn’t a problem. There were lots of open seats. But if you’re worried, get reserved seats. 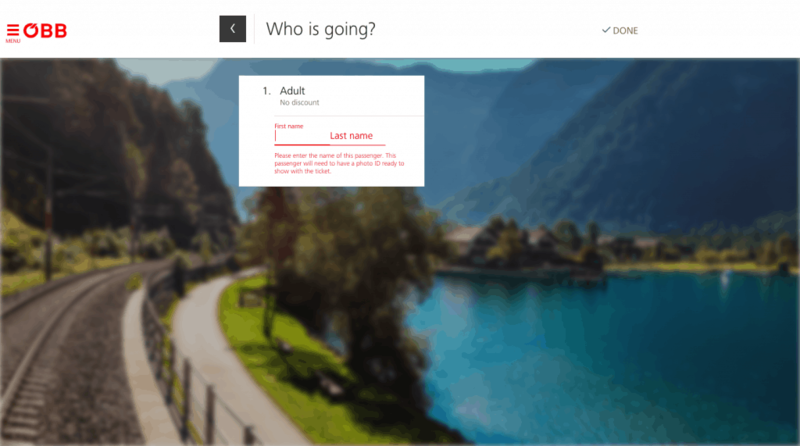 Step 7: Enter passenger name. Step 8: Enter your email address and payment details. Step 9: Be sure to get your ticket! After you submit payment, you should receive an email from OBB with a PDF of your receipt. The email will be in German. Please note that this email is NOT your ticket! Get it printed at the station. Access it via the OBB mobile app on your smartphone. I used option 2. Just be aware that if your phone malfunctions or you don’t have access to Internet/data and can’t load it, you’ll be in trouble. The way the train cars are set up, you push open a door and walk through a hall with compartments (which also have doors) with 6 seats each. 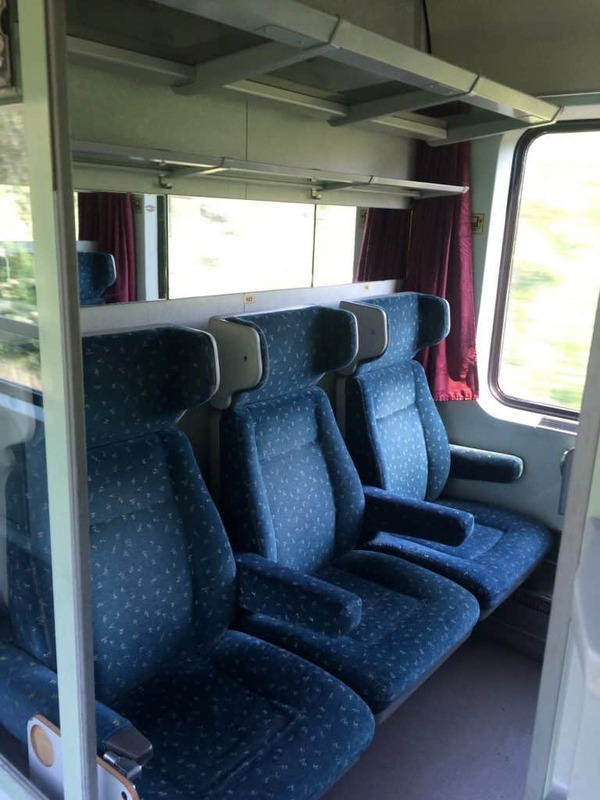 When you slide open the compartment doors, this is what you see: six seats (3 on each wall) with luggage racks overhead). 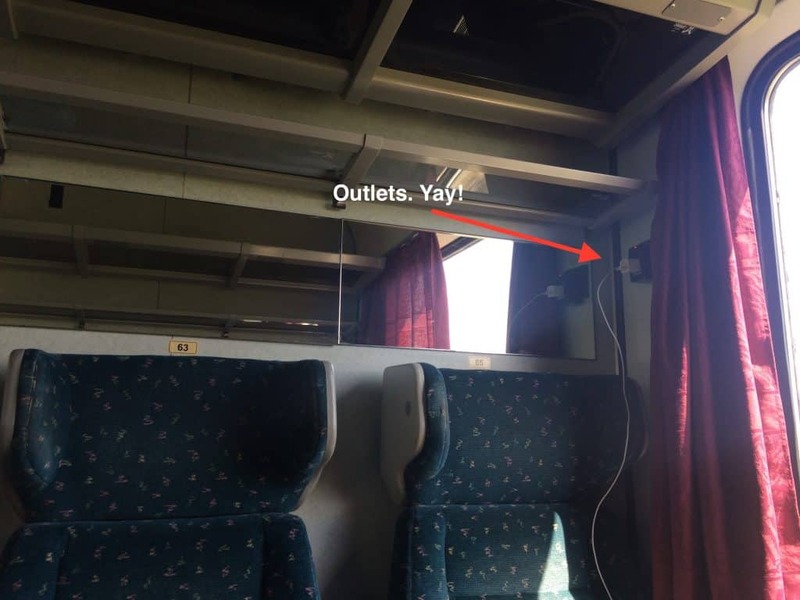 You’ll be thrilled to learn there ARE outlets for you to charge your phone during the journey—just don’t forget an adapter! 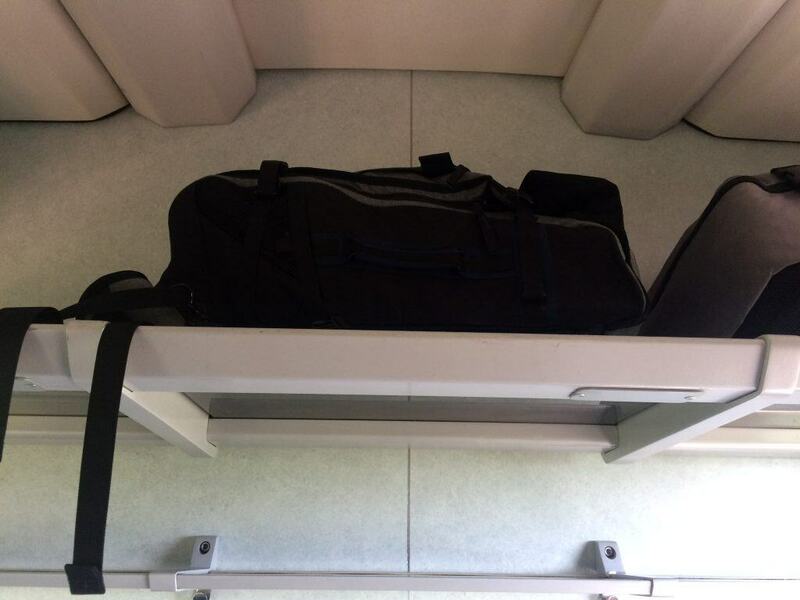 The luggage racks are above the seats. You’ll need to have enough strength to throw your luggage up there! My Timbuk2 backpack fit perfectly. 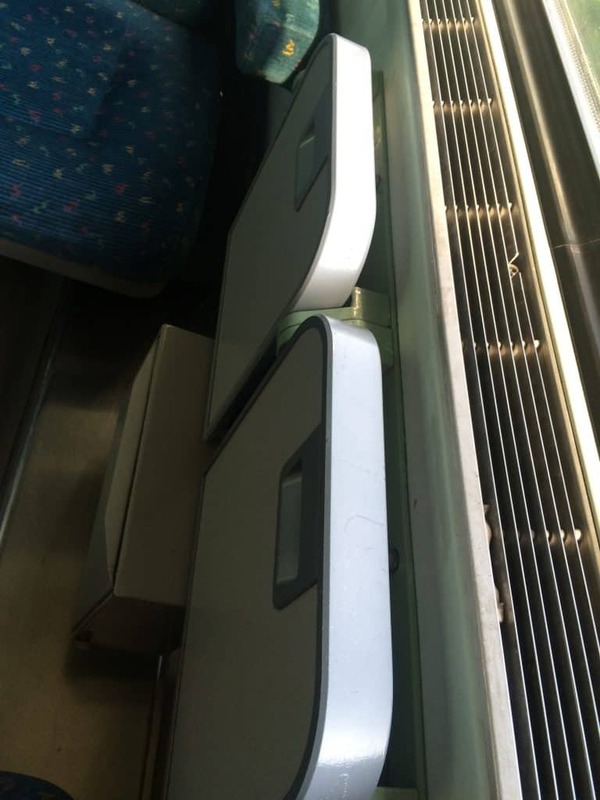 Along the windows, there are folding trays. 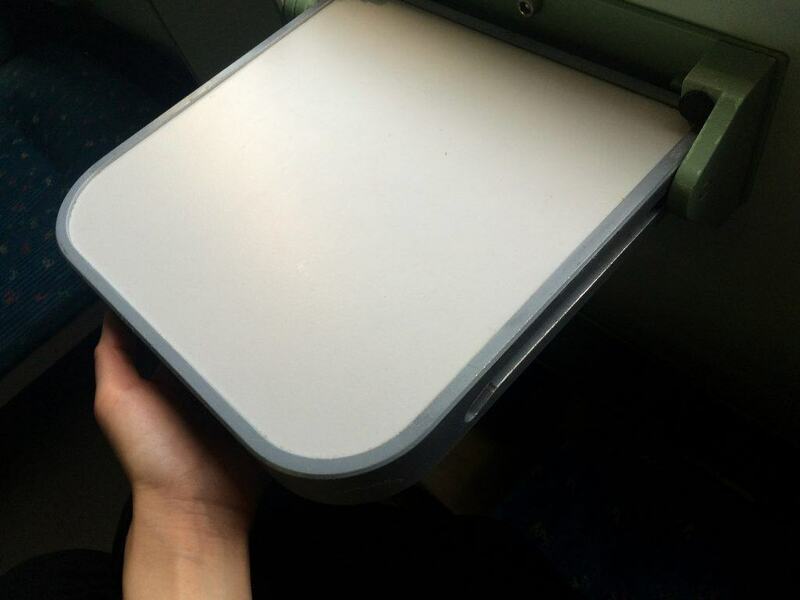 You just reach for the handle and pull the tray down. 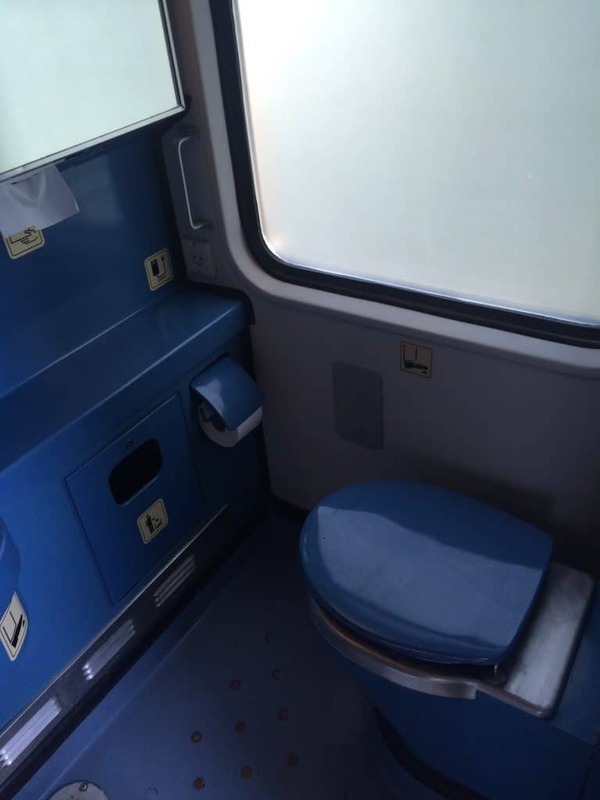 What are the bathrooms like on the train from Vienna to Budapest? 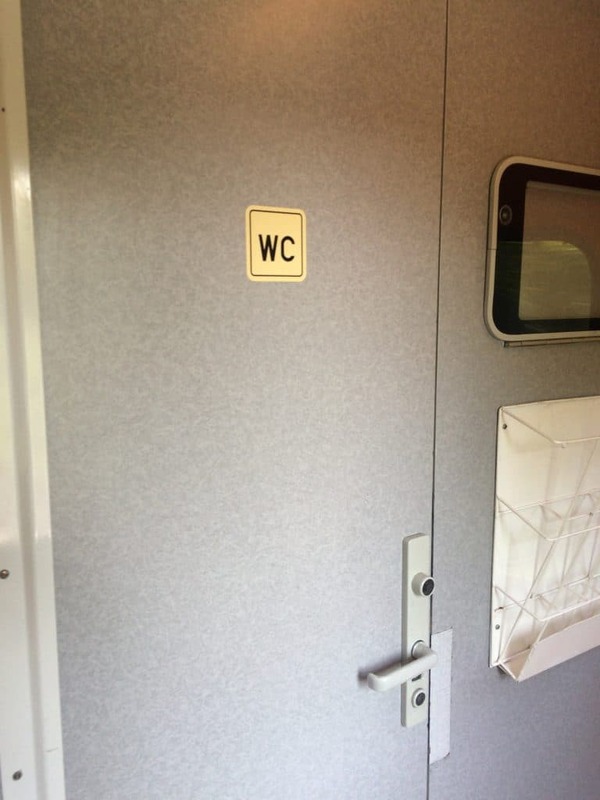 Bathrooms are marked with “WC” (water closet). 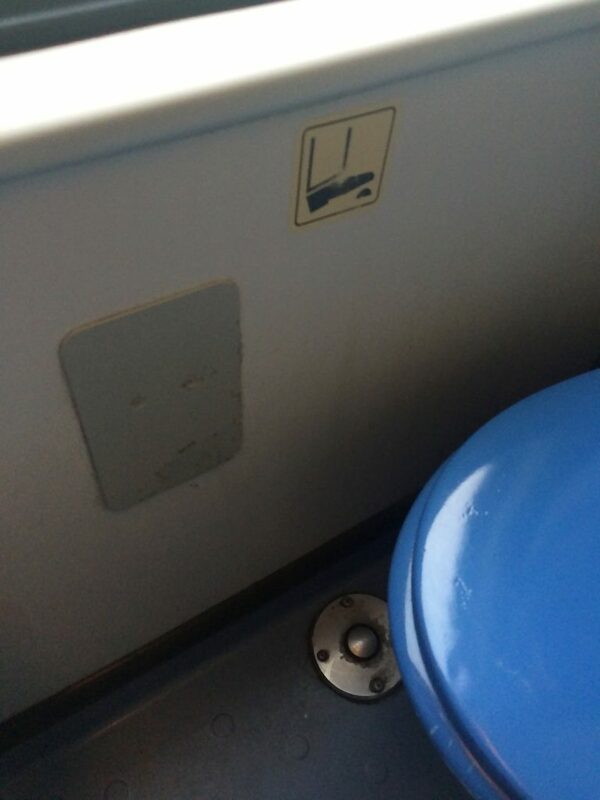 You’ll need to step on the little metal pedal on the floor to flush the toilet. 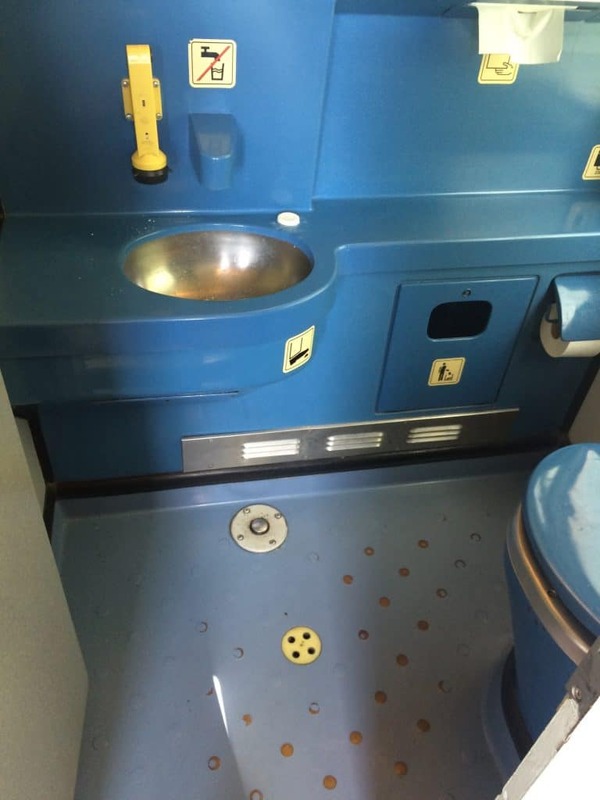 There’s also a pedal in front of the sink that you must step on to get the water flowing. Here is the sink. 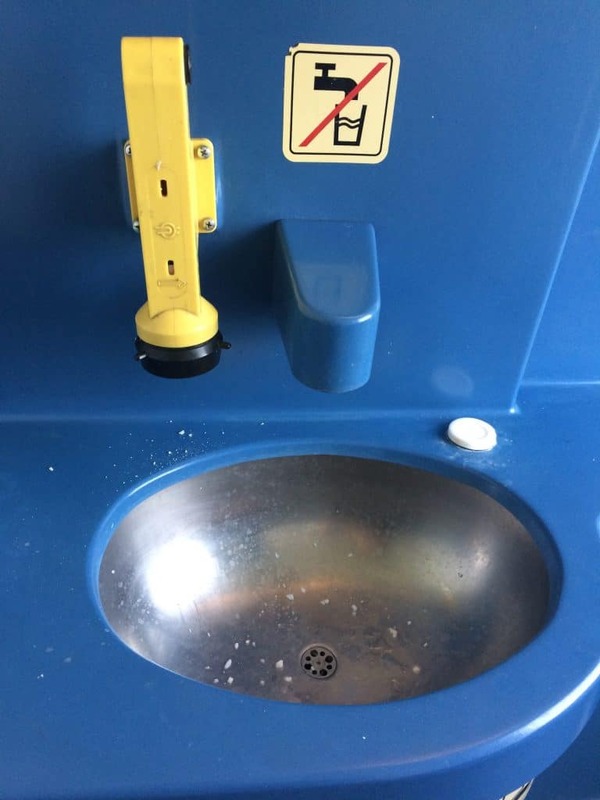 DO NOT drink the water from the sink. That little yellow cylinder to the left is the soap—it’s powder! You turn the little black knob on the bottom to release the powdered soap into your hands. Yay for paper towels! 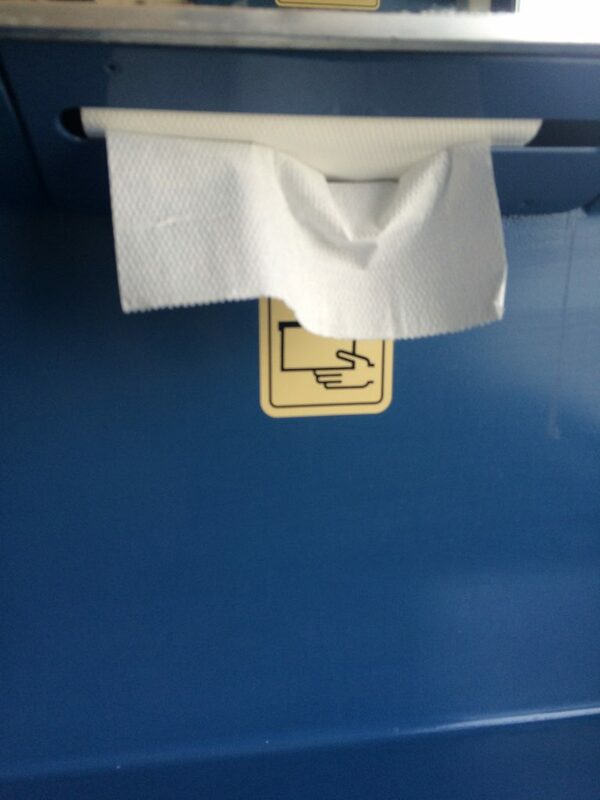 The one thing I learned about taking trains in Eastern Europe is you NEVER know if the bathroom will have toilet paper, paper towels, or even soap. So be prepared! IMPORTANT: At least on the route I took, the train will stop at 5:14 p.m. (destination time for me was 5:19 p.m.) for a few minutes in a nondescript station with no signs and lots of graffiti. The employees will get off. This is NOT Budapest Keleti—do NOT get off yet! During the ride, employees checked our tickets twice and scanned them. One time it was Austrian employees. Another time it was Hungarian employees. They never checked our passports. The train ride was long and hot. It was less than three hours and there was AC, but it felt longer and my sweat told a different story. What a stark contrast between the train to Austria and the train to Hungary! 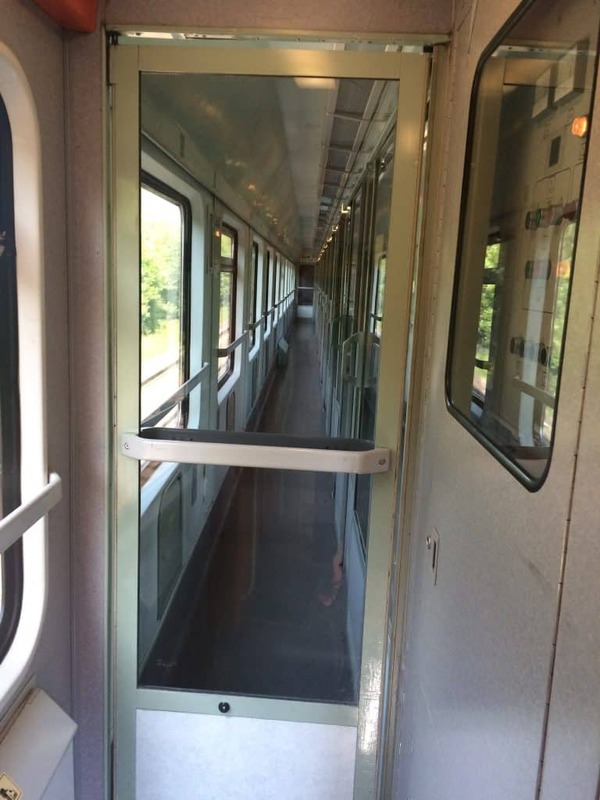 Many railcars had completely empty compartments. We were seated in the caboose so we could look out the back window and watch the train tracks fly behind us into infinity. The train looked older and more run down than the Austrian one. And the heat! Whereas on the Austria train I kept eating and eating, on the Hungary train I sat as still as possible, trying my best not to produce any more body heat. The sun beat down on our tin can. We shut the maroon curtains just enough to block the sunlight from touching us directly, but also allow us a view of the landscape. And what a difference! No more mountains. It was mostly flat. And rather dry. Lots of old buildings. The stations we stopped at had much older, rundown railcars that looked like they are no longer in use. When we left Austria, they stopped making announcements in English for the most part. What blared out of the speakers was something unintelligible. Around the time we were supposed to arrive in Budapest-Keleti, we stopped for a while at a nondescript station with lots of graffiti. The employees in white shirts exited the train. Some people boarded. We and the other American backpackers in our railcar got out, confused. 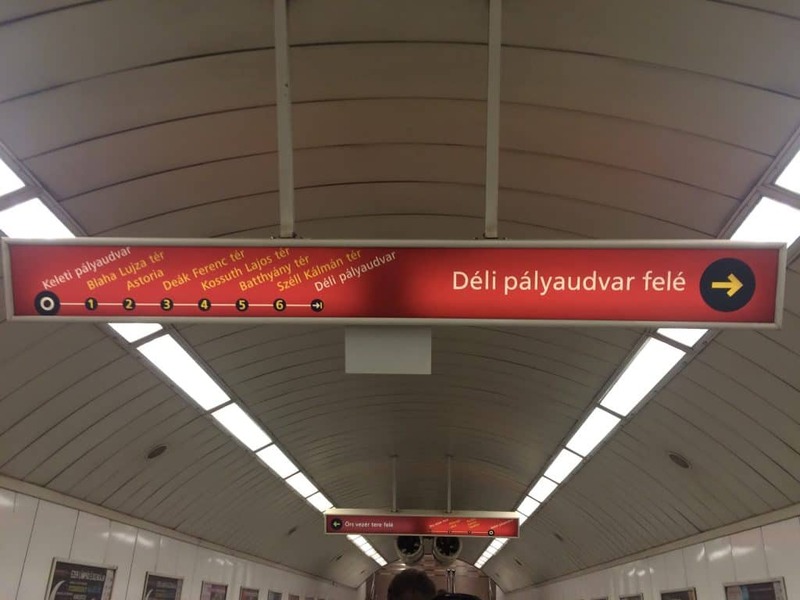 Was this Budapest? Why didn’t it have a sign? And why was it so sketchy? There were no employees around to help us. A Hungarian man who had boarded tried to explain something to us and we finally understood that Keleti was the NEXT stop. Getting out at the Budapest-Keleti station shook me. While we were trying to get a ticket at the self-service machine, a man with a blue polo shirt and dark jeans kept hassling us. He smelled bad. He got in our space. He wouldn’t leave us alone. He tried to say he worked for the government. He made us so uncomfortable we finally just left without purchasing our tickets. Instead, we sought shelter inside the purple Information office nearby. It was cool. It felt safe. We got our tickets from an employee. We bought the 3-day pass. Then we rushed to the tram station. The escalators down were so steep that I got motion sickness as I watched the black, brown, and white tiled floor beneath me come rushing at me, and I couldn’t tell if I was standing or falling. It was crowded getting into the station. The only “checkpoint” was 2 bored looking employees who quickly glance at your ticket as you hold it up to them. The tram itself was uneventful. We were on high alert and had our guards up. 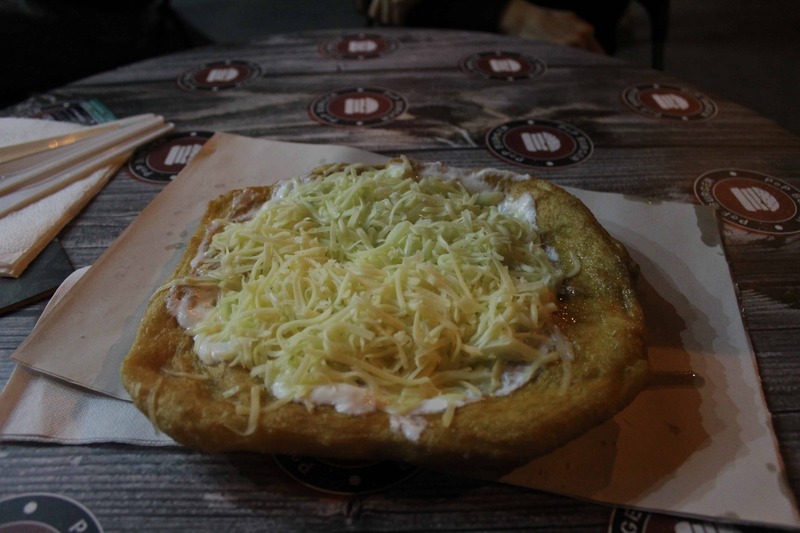 I think all of us were second-guessing our decision to come to Budapest. Thankfully, we had David in our pocket. David was our exceedingly helpful Airbnb host. He had been texting me on Whatsapp a couple days before our arrival, and I would text him complaints of the hot train and questions about where to meet him. When we finally arrived at our meeting point, we all breathed a sigh of relief. The streets opened up to beautiful pedestrian paths lined with luxury shops and Burger King and McDonald’s. I don’t think I’ve ever been so happy to be in a tourist area. It felt much less frantic. We collapsed onto a nearby bench, sweaty, our shoulders aching from the weight of our backpacks. 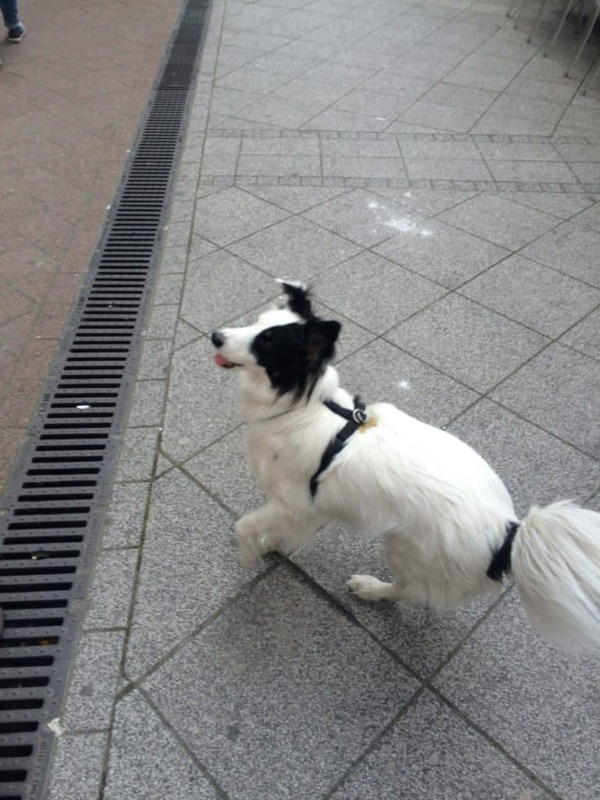 Shortly after, David came around the corner, bouncing along with his little shepherd street dog Misa. He had big hipster glasses on and a long piece of hair with a slight curl at the front that would sweep over his forehead when he was looking down. What an interesting and upbeat guy! We were all relieved to finally be “home” and to have a host who would help us. Dogs make everything better, right? 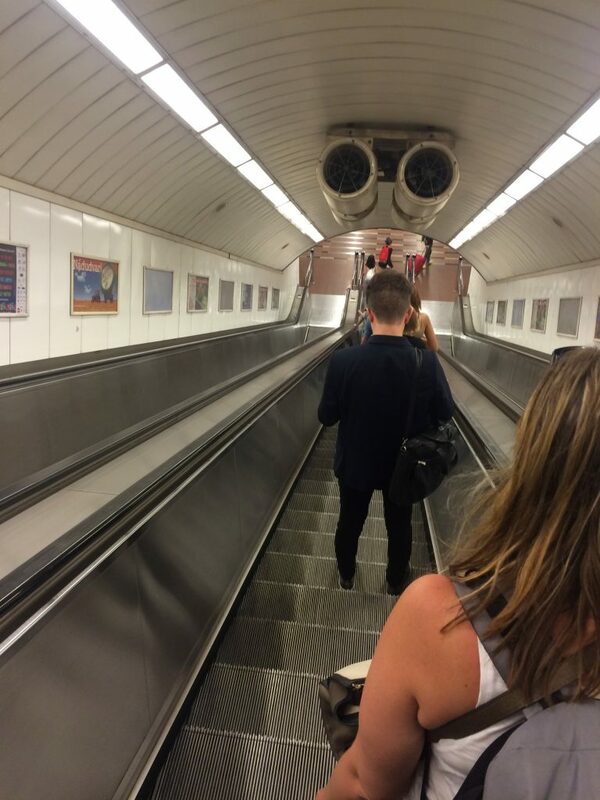 Upon exiting the train, walk out of the platform and turn left. Look for the big purple offices to your right. Go inside and order your Metro pass. We were there for three days, so we did a 72-hour pass. Then walk out and head straight ahead and go to the Tram. 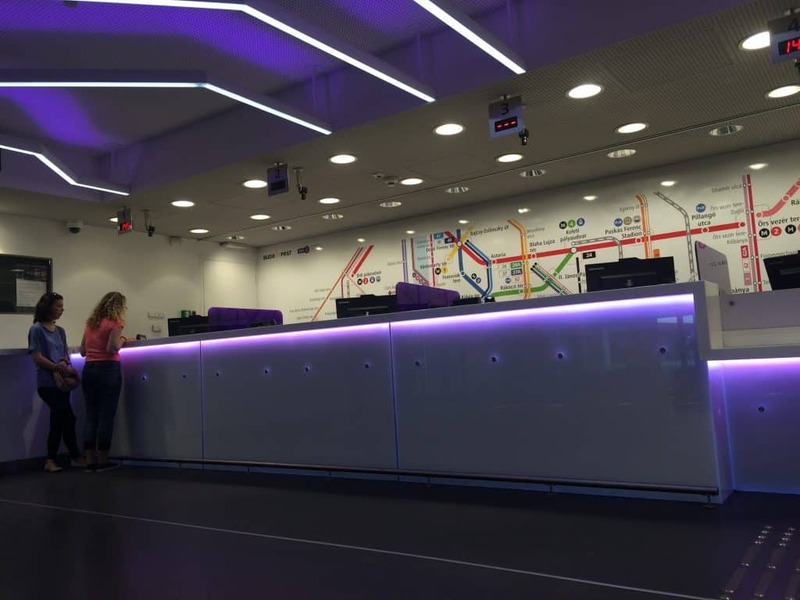 Alternatively, there are purple ticket machines just outside the information office. If you don’t want to deal with employees, you can try these. We stayed in an Airbnb. HIGHLY recommend David and Sophia’s place. I wore this multi-way dress everywhere. If you’re an American, you’ll need an adapter to plug in your electronics. I stashed my passport in this stealthy runner’s belt. 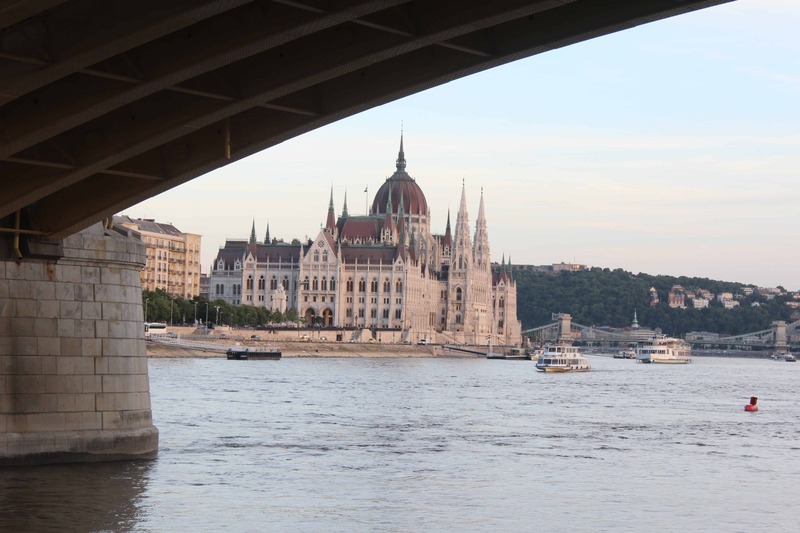 >>Be sure to read my post that shares my full Eastern Europe rail trip itinerary! 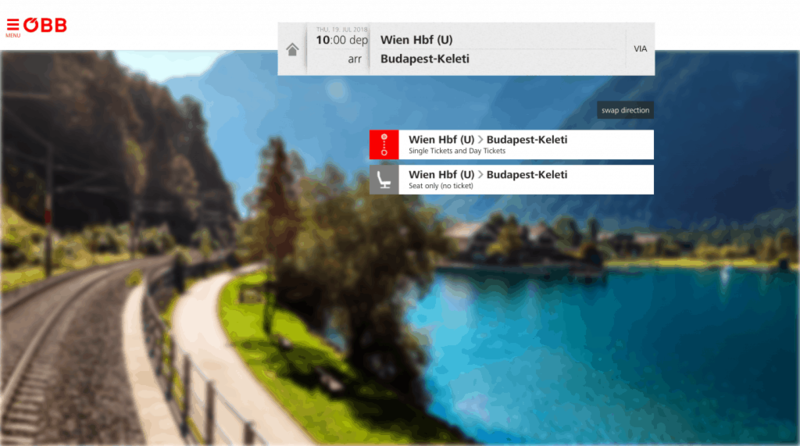 3 Days in Budapest? Don’t Miss These Sites, Activities, and Foods!